I’m probably not the most green person on this planet. I drive a car to work every day, while a bike could easily overcome the 10 kilometers from my bed to my desk. I live in a city where they still have a garbage bag in which you’re allowed to throw everything in, so my empty cans of soda sit happily next to PET bottles and my kitchen leftovers. Although I must say that food leftovers hardly make it to the bin, I hate throwing out food. In the knowledge that any effort, regardless how small, makes a difference – and thus may compensate for my lazy car addiction and dreadful recycling skills, I try to adapt our daily menu to the season’s availability. In-season veggies and fruit have plentiful of benefits. You can find good quality products with your local farmer or market, which means fresher products for you and less transit burden on the environment. Also they tend to be cheaper, so they are healthy on your wallet and at the same time you are supporting the local economy. That’s basically the background of how the red beet ended up on my menu lately. You may think of this veggie as being a common ingredient, but for me it isn’t. For some reason my mom never used it in her cooking, at least not that I can remember, which could explain why it took me over 4 years of independent living before adding this sweety to my shopping list. The sweetness of the red beet calls for a punchy and fresh flavor next to it. This recipe with watercress and a goat cheese side dish has been on my to-try list for a long time, so I was happy when along with the month of August the beet season arrived. Wrap each beet in aluminium foil and place them in a pre-heated oven at 200°C for about 1 hour. Leave to cool, then cut into thick slices. Melt butter in a pan and fry the meat on each side until brown. Slice the onion and the garlic cloves and cover the bottom of a roasting pan or Dutch oven with the onion, garlic and beets. Place the tenderloin on top and roast in the oven for about 30-45 minutes. Remove from the roast from the oven and cover the meat with aluminium foil. Carefully put aside the slices of onion and beet, then mix the mustard and the vinegar with the meat juice that has remained in the pan. 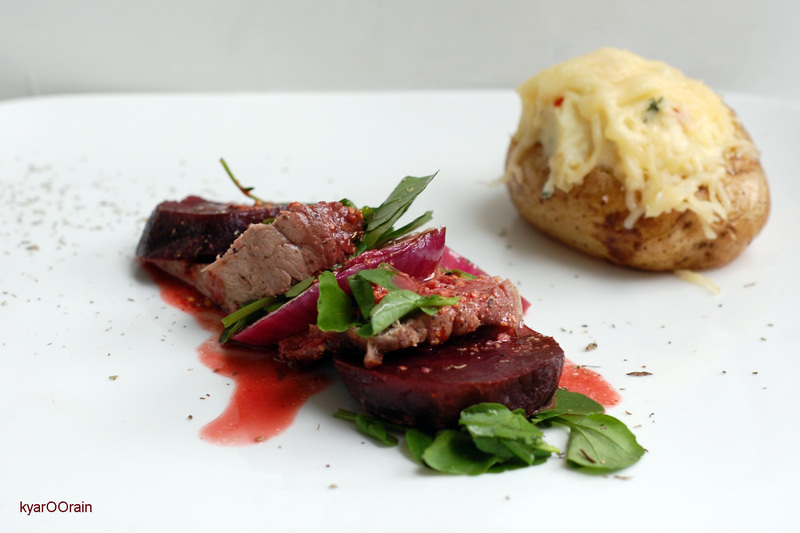 Cut the meat into slices, then serve in layers of meat-onion-beet, finishing with some watercress. Serve with a goat cheese side dish and the sour meat juice. roasted goat cheese potato, 4 servings: 4 large potatoes, 150g soft goat cheese, 60ml buttermilk, thyme, lemon zeste, 1 tsp lemon juice, parsley, some grated cheese. Wash potatoes well, pinch a few holes with a fork and rub with olive oil. Place in a pre-heated oven at 200°C for about 45 minutes until you can easily stick them with a fork. Leave to cool. Remove the inside and turn into a potato mash by adding the butter milk, goat cheese, lemon zest and lemon juice. Add flavor with thyme, parsley, salt and pepper. Fill the empty potato skins with the potato mash, cover with grated cheese and place back into oven until the top cheese layer is crispy.